Marketers have long sought to cash in on every celebration, from Valentine’s Day to Halloween; and, as email marketers, we’re no different. There’s just something about holidays that puts people in the mood to spend — it would be foolish not to take advantage of that! But here’s the problem, not everyone has a Valentine, and not everyone likes to celebrate Halloween. What’s one occasion that everyone does acknowledge? The power of the birthday email is unmatched because we all have birthdays, and, whether we like or dislike celebrating the fact that we’re one year older, we all enjoy getting a little something for nothing. 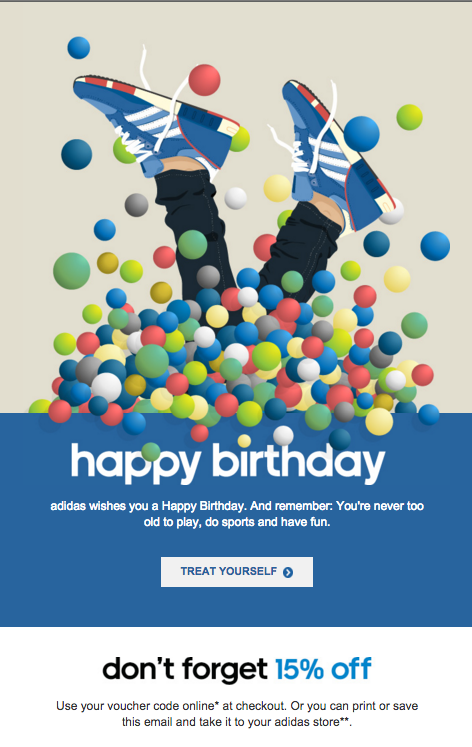 This email, sent a week before the customer’s actual birthday, allows Adidas to stand out as a company that values their customers. The framed quotes are fun to read (it seems like there’s one to suit everybody! ), and the copy is short and snappy: Order today, wear it on your birthday. This further personalisation really shows that Adidas think of their customers as individuals, and this is an excellent way to turn people into loyal, lifelong customers. 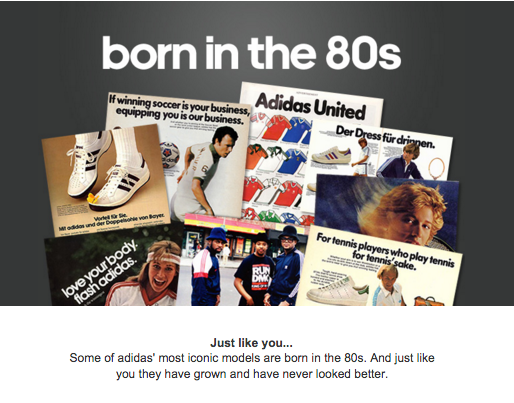 This further places Adidas at the top of the customer’s mind, and if they wanted sportswear for their birthday, then it’s highly likely that they purchased from Adidas. It’s no coincidence that only one of these emails was opened. Not only is the Miss Selfridge offer lower, it’s also not personalised. By not recognising the customer’s birthday, Miss Selfridge really missed a trick here, and Topshop improved that all important email open rate, and maybe got themselves an email click too. 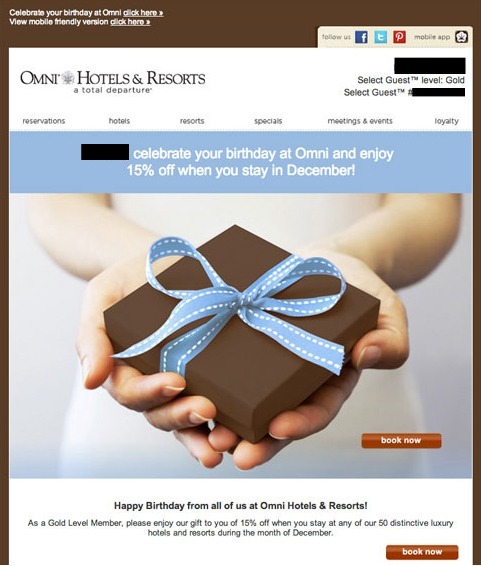 This email, received three weeks before the recipient’s birthday is a great way for Omni to encourage customers to celebrate their birthday at one of their resorts or hotels. As customers, we know of so many different businesses — clothes shops, grocery stores, hotels — and it’s easy to let one slip our mind. That’s why this birthday email is so great! It says, to a customer who may not have been thinking about it at all, ‘celebrate your birthday here and we’ll give you a discount‘. 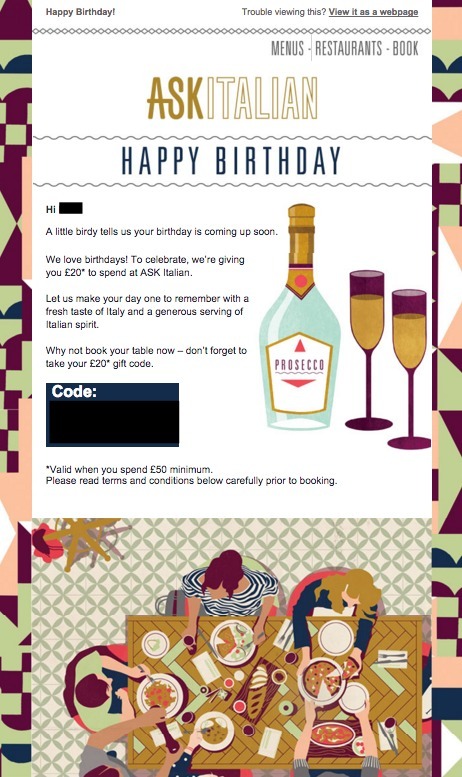 This email not only has a great design, but it sends out a great message too: We’d love to have you come here and enjoy your birthday with your friends. In most towns, there’s a restaurant on every corner, so, to get ahead of the competition and make sure that customers continue to choose you, you have to make more than good food. Birthdays are often celebrated with a party or a meal, and this email encourages the recipient to pick ASK Italian for their celebration. 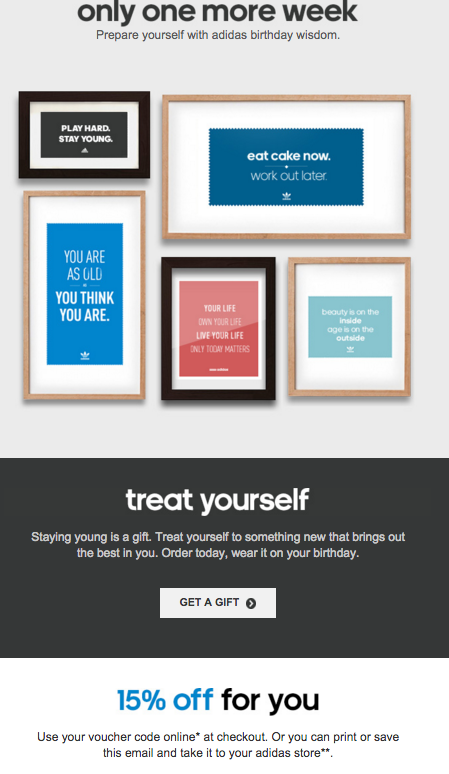 Timely, automated birthday emails are easy to create! We’re going to show you how! 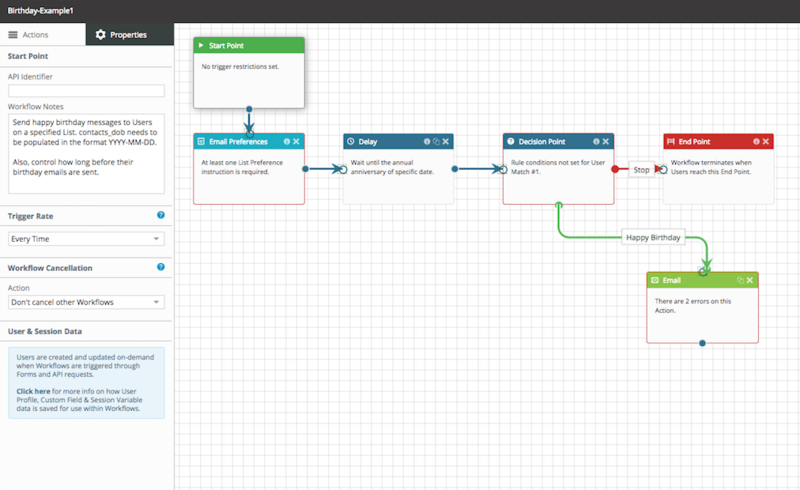 Our new feature: Automation, gives anyone the tools needed to create timely, personalised, and, of course, automated email workflows. 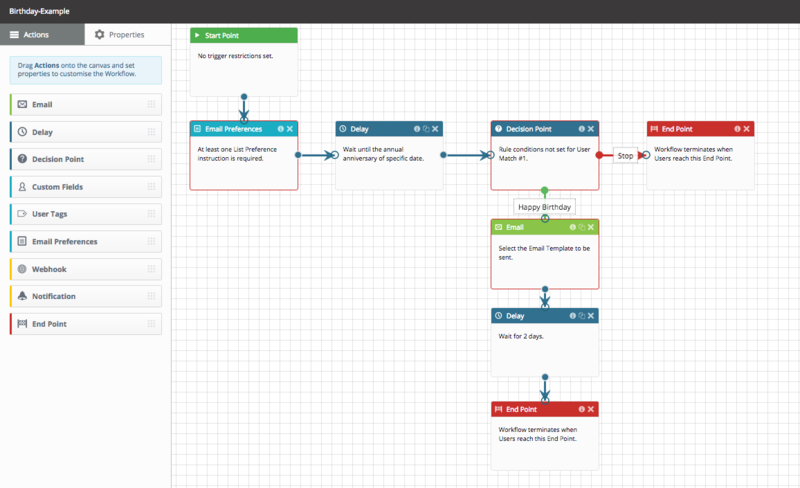 It’s easy to use and allows you to personalise your campaigns as much as you want. Take advantage of our free 14 day trial. It’s shocking that birthday campaigns are only used by a measly 19% of marketers! Especially when there is such comprehensive evidence on not just the power of birthday emails, but the power of automation in general! If you want to find out more about how automated emails can improve your email marketing then download our new eBook: The Complete Guide to Email Marketing Automation.